From famed director Billy Wilder, 1957�s Love in the Afternoon offers a romantic comedy. In Paris, private detective Claude Chavasse (Maurice Chevalier) consults with a client known solely as "Monsieur X" (John McGiver). �X� believes that his wife (Lise Bourdin) cheats on him with an American businessman named Frank Flannagan (Gary Cooper). �X� insists that he will murder Frank to avenge these indiscretions. Claude�s daughter Ariane (Audrey Hepburn) overhears the chat between Claude and �X�, and she decides to warn Frank. This leads to a romance between young Ariane and the much older Frank. Indeed, quite a gap in years existed between Cooper and Hepburn � 28 years, to be precise, and the age difference really shows. In his mid-50s at the time, Cooper would be dead from cancer four years after the film�s release, and he looks far too old for the pairing with 28-year-old Hepburn. Granted, we�ve always seen old leading men with young women in Hollywood, but the manner in which Cooper shows his age makes this pairing tougher to swallow. We�re supposed to view Frank as a dynamic ladies� man, but he suffers from an appearance that lacks vigor. Why do all the women swoon for Frank when he looks like he should be playing bingo in a retirement home? Cooper was 56 at that time, but honestly, he looks closer to 70. This makes him a bad physical match for the substantially younger Hepburn � Cooper almost appears as old as then-69-year-old Chevalier. Never the most emotive actor, Cooper can�t add much charisma to his character. Frank seems like a role tailor-made for Cary Grant, an actor nearly as old as Cooper but one who seemed more youthful and vital as of 1957. And more dynamic. Cooper fared best with stoic, low-key roles, so I never buy him as a suave romantic lead. Again, that�s Grant territory, and Cooper feels like a poor fill-in. Even Clark Gable would�ve worked better. Since he was the same age as Cooper � and would be dead in a few years as well � Gable was also too old to play Frank, but if the movie wanted a nearly elderly actor for the part, at least Gable boasted romantic charisma. Cooper didn�t, and he flops as Frank. Hepburn also seems too old to play the conservatory student, as the script appears to want us to buy Ariane as a late teenager. I also find it perplexing that Hepburn doesn�t even attempt a French accent, a choice made more confusing since everyone else � including her onscreen father � does speak that way. 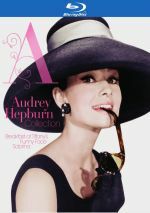 Still, I find it easier to buy Hepburn�s work than Cooper�s, and she does her damnedest to add spark to the proceedings. The script doesn�t give her much to work from, though, as Ariane mainly swoons or mopes. This means Hepburn sleepwalks through the film and doesn�t bring a lot of charm to the proceedings. It doesn�t help that Love takes an awfully long time to get Frank and Ariane together � time that the movie doesn�t use especially well. The narrative tends to dawdle and lack much zing, lapses that surprise me given Wilder�s talents. I never imagined he�d make a movie so sluggish and dull. The movie�s biggest failings still come back to the inappropriate casting of its leads, though. Cooper and Hepburn seem so wrong for their roles that it becomes tough to embrace their characters and buy into the romance. A dull, aimless romance, Love fizzles. 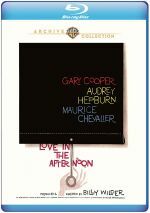 Love in the Afternoon appears in an aspect ratio of approximately 1.85:1 on this Blu-ray Disc. This was a less than stellar image. Most of the issues connected to sharpness, as the movie tended to look rather soft at times. Some shots came across with good clarity and accuracy, but more than a few veered toward the mushy side. I saw no jagged edges or moir� effects, and edge haloes remained absent. Print flaws failed to appear and the presence of moderate grain implied that the transfer suffered from no noise reduction. Blacks tended to be a little too dark, and contrast appeared somewhat flat. Low-light shots usually appeared a bit bland and dense. This may well be how the film always looked, but the image seemed surprisingly unappealing. Love came with a competent DTS-HD MA monaural soundtrack. Speech showed a little edginess and sibilance, but the lines remained reasonably warm and natural. Effects and music displayed similar dynamics, which meant that though the elements lacked much punch, they sounded reasonably clear and tight. While nothing here excelled, I thought the mono track merited a �B-�. The disc includes a trailer and no other extras. Despite the presence of a few Hollywood legends, Love In the Afternoon fails to deliver an enticing romantic comedy. The leads seem miscast and the script never manages to engage. The Blu-ray offers average visuals and audio but lacks supplements. Given its pedigree, Afternoon becomes a disappointment.